The Ronin can be configured in any of three operation modes for different requirements with no change in functionality. Upright (over-slung) Mode gives an eye-level viewpoint, while the normal under-slung mode is for any viewpoint from chest height to ground level and in this mode can be supported by a jib or crane. Finally there is Briefcase Mode which is better for negotiating tight spaces but still with full functionality. Unlike some other gimbal systems, the DJI Ronin does not require tools for adjustment, as it has a built-in balance adjustment system. In fact setup is possible in as little as 5 minutes when changing position or configuration and the ATS (Auto Tune Stability) technology intelligently fine-tunes the gimbal to your rig. Smooth-track Control also allows for smooth changes in camera angle for a single operator. The Ronin uses technology from DJI’s Zemuse range of gimbals (brush-less motors, multiple control modes and built-in IMU) for an ultra-smooth operation, and comes supplied with a 2nd operator remote control which enables the second operator to control camera movement independent of gimbal movement. Additional features of this model include a quick release detachable top handle bar, quick swap smart battery, power distribution box, mountings for 15mm rods, Bluetooth Assistant software, and an Assistant app giving the Ronin’s vital stats in real time. Developed for the film-making professional, the DJI Ronin marks a generational leap in camera stabilization technology. Its custom sensors, powerful motors and advanced algorithms put world-class precision in your hands. 3 different modes of operation allow the Ronin to be used in different scenarios, all of which can be entered without changing settings on the Ronin Assistant app or a 2nd operator remote. Smooth-track functionality remains in all three modes. 1. Upright Mode: Flip the gimbal over to bring the camera closer to eye level for a higher perspective without straining to lift it. Use this mode when sticking the Ronin out of a car’s sunroof or when trying to shoot over a crowd of people. 2. Under-slung Mode: The default gimbal operation is the Under-slung mode. The camera can be comfortably held low to the ground, at chest level or anywhere in between. This mode is also used when the Ronin is suspended from a camera jib or crane. 3. Briefcase Mode: When a slimmer gimbal profile is needed, i.e. when moving through doorways or narrow paths, Briefcase mode is ideal. It allows the gimbal to be held to the side and close to the legs, much like a briefcase. The feature-rich iOS and Android DJI Assistant software allows easy setup of all system configurations. The PC and Mac Assistant also provides control of all the Ronin’s functionalities in addition to firmware upgrades for future features. The Ronin is not customized for any specific camera. It can be easily adjusted to carry everything from small & light M4/3 cameras to heavier systems like the Red Epic. The DJI Zenmuse gimbals were the first commercially available systems in the world to utilize brush-less motor technology for professional filming and aerial photography. The Zenmuse gimbal line has long been a benchmark that others have been measured against. The Ronin is based off the same technology and also offers multiple control modes, a built-in IMU, and customized direct drive brush-less motors. An included 2nd operator transmitter allows a 2nd operator to pan, tilt, and roll independent of the Ronin’s movement. Smooth-track speeds and operation modes can be assigned with 2 custom toggle switches on the transmitter. A customized, advanced 32-bit floating point DSP processor offers more efficiency than an ARM processor, for faster processing of signals from the on-board encoders. The top bar features a quick release system allowing easy attachment and detachment for rapid setup and break down. The same attachment can be used for vehicle or multi-rotor mounting. Over 6 Hours of Run time Easily mount accessories including a video monitor, 3rd party video transmitters and more on the top bar accessory mounts. An extremely strong, durable and water tight carrying case with rolling wheels provides easy transportation. Dense custom cut EPP foam protects the Ronin and accessories. 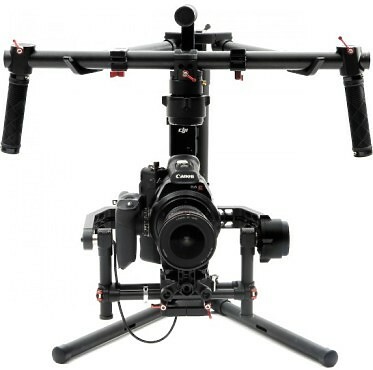 Hire the DJI Ronin Gimbal from Procam. Best service and rental rates for the DJI Ronin Gimbal and all cameras, lenses, sound, lighting and grip.